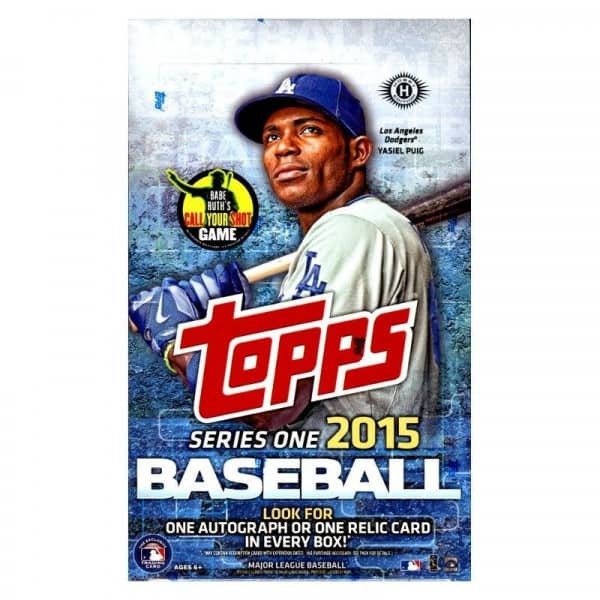 Factory Sealed 2015 Topps Series 1 Baseball Hobby Box mit 36 Packs a 10 Cards per Pack. 1 Autogramm oder Relic Card per Box ! Produktinformationen "2015 Topps Series 1 Baseball Hobby Box MLB"
Factory Sealed 2015 Topps Series 1 Baseball Hobby Box mit 36 Packs a 10 Cards per Pack. Auf dem Box-Cover befindet sich Yasiel Puig - Right Fielder der Los Angeles Dodgers. 2015 Topps Baseball Series 1 is back with the biggest base set in a decade! With 350 base cards in Series 1, collectors can look forward to putting together a base set of 700 cards throughout the year. All the big hits from 2014 return, including Strata Signature Relics and the standard Hobby box exclusive clear parallel of the entire base set. 2015 Topps Baseball Series 1 will feature new inserts, autographs, and relics celebrating some of the greatest moments in Baseball history, as well as the biggest stars of today. And the 2015 Topps online program is sure to keep collectors coming back throughout the year and beyond! Key Rookies: Javier Baez, Rusney Castillo, Joc Pederson, Jorge Soler, Dalton Pompey, Michael Taylor, James McCann, Trevor May, Brandon Finnegan, Mike Foltynewicz, Daniel Norris, Steven Moya, Rymer Liriano, Matt Barnes. The biggest base set in a decade! 350 base cards, featuring Veterans, Rookies, Future Stars, League Leaders, 2014 Baseball and World Series Highlights, and Team cards. - Gold - Sequentially numbered to 2015. - Snow Camo - Sequentially numbered to 99. - Pink - Sequentially numbered to 50. - Framed Parallel - Framed in silver, similar to Museum Collection. Sequentially numbered. HOBBY & HOBBY JUMBO ONLY. 1 PER CASE! Inspirations 15 dual subject cards featuring a current player and a former fan-favorite from the same team. Inserted 1:8. Gallery of Greats 25 of the greatest of all time on thick, paper-framed cards. HOBBY & HOBBY JUMBO ONLY. Free Agent 40 Free agency is 40 years old. These 15 cards take a look at some of the biggest signings in history. Inserted 1:8. Archetypes Featuring 25 players from throughout the history of MLB who were the best at what they did. Inserted 1:6. Highlight of the Year Throughout 2015, in Series 1, 2, and Update Series, the highlight of each year since 1925 will be featured. 30 will be found in Series 1. Inserted 1:4. Baseball/History The history of baseball is intricately intertwined with history itself, and this insert brings that into focus. Thirty cards will pair a baseball highlight with a historical event that occurred on the same day. Each event will have its own card for 15 total pairs. Inserted 1:8. Stamped Buybacks Vintage Topps cards stamped with a buyback logo. HOBBY & HOBBY JUMBO ONLY. 2 PER BOX. 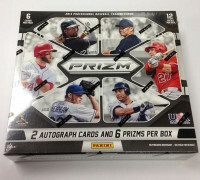 COMMEMORATIVE RELIC CARDS: 1 PER HOBBY BOX! MLB Silhouetted Batter Logo Pin: Featuring stunning metalized recreations of the MLB logo found on all jerseys! Future Stars Pin: Featuring the top ten Future Stars from 2015 Series 1 with a special pin created just for this set. - Future Stars Pin Vintage Parallel - With a recreation of the 1987 Future Stars logo Numbered to 99. Birth Year Coin and Stamp Cards: Cards featuring superstars from across the history of MLB and a coin and stamp from the year of their birth. - Quarter with Stamp and Autograph - Numbered to 10. On-card! Archetypes Autograph Relics: Numbered to 10. Highlight of the Year Autograph Relics: Numbered to 10. Inspirations Dual Autograph Relics: Two autographs and two relics per card! Numbered to 10. Gallery of Greats Autograph Relics: Numbered to 5. ON-CARD! Free Agent 40 Autograph Relics: Numbered to 10. World Series Champion Autograph Relics: Numbered to 50. Postseason Performance Autograph Relics: Numbered to 50. Strata Signature Relics: They're back! Numbered to 25. On-card! Career High Autographs: Autograph cards recognizing the career high in stats of stars of yesterday, today, and tomorrow. Archetypes Autographs: Numbered to 25. Highlight of the Year Autographs: Numbered to 25. Inspirations Dual Autographs: Two autographs per card! Numbered to 25. Baseball/History Cut Signatures: Featuring cut signatures from key participants in some of the most important events in history. Numbered 1/1. Free Agent 40 Autographs: Numbered to 25. World Series Champion Autographs: Featuring members of the 2014 World Series Champions with an autograph. Numbered to 50. Postseason Performance Autographs: Featuring stars from the 2014 Postseason with an autograph. Numbered to 50. Strata Cut Signatures: Numbered 1/1. Career High Relics: Relic cards recognizing the career high in stats of stars of yesterday, today, and tomorrow. Archetypes Relics: Numbered to 99. Highlight of the Year Relics: Numbered to 99. Inspirations Dual Relics: Numbered to 50. Baseball/History Stamps: Each of these cards will have a stamp variation featuring a stamp from that year. Numbered to 10. Free Agent 40 Relics: Numbered to 50. World Series Champion Relics: Numbered to 100. Postseason Performance Relics: Numbered to 100. The Pennant Chase: A card will be created for each team. If the team on the card wins the pennant, it can be redeemed for a prize! Limited to 50 for each team. Online Code Card: With a code for use in this year's online program. Inserted 1:6. Weiterführende Links zu "2015 Topps Series 1 Baseball Hobby Box MLB"
Fanbewertungen für "2015 Topps Series 1 Baseball Hobby Box MLB"